The German Panzerkampfwagen VI, better known by its official designation “Tiger”, has sealed its reputation both on the battlefields of the Second World War and in the ongoing scholarly and public fascination with that conflict. Almost of equal interest are the men who commanded these machines, the most famous being Michael Wittmann. However, over the course of the war, there was a whole host of talented and distinguished Tiger commanders that fought well on both Western and Eastern fronts, most of which are relatively unknown today. One such, less well known Tiger commander was Franz Staudegger. His story begins on the first day of the battle of Kursk, July 5th. After a day of heavy fighting, Staudegger moved to rejoin his unit by night. En-route, he encountered a tank along the road with its commander standing in the turret smoking a cigarette. When he dismounted his Tiger to tell him to move out of the way, he realized it was actually a Russian T-34 tank. Thinking quickly he threw a hand grenade into the open hatch, destroying the tank. At this point, he noticed another Russian tank right behind the first one. He ran over to it and as the crew opened their hatches to see what was going on he tossed a second-hand grenade into this tank and destroyed it. 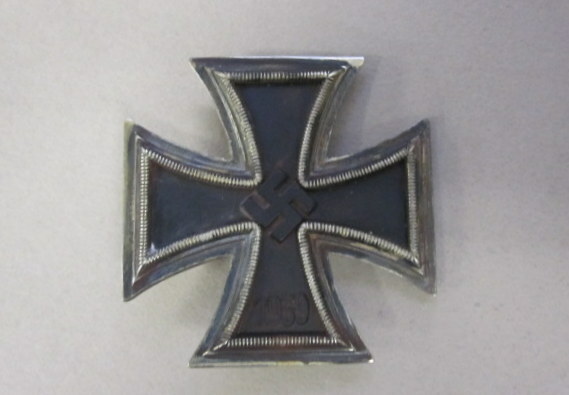 For the destruction of two tanks in close combat, he was awarded the Iron Cross First Class. It was only the beginning, however. Three days after this incident, the Russian 10th Tank Corps launched an attack on the German 1st SS Panzer Division Leibstandarte. They struck them at a time when the majority of the division’s tanks were fighting further west and were unavailable to assist in halting the attack. The only exceptions were two damaged Tigers commanded by Franz Staudegger and Rolf Schamp. Despite damage to the tanks’ tracks and running gear the crews’ were able to complete some quick repairs so to at least make the Tigers mobile, and they decided to try and defeat the impending armored assault. While Schamp guarded his flank, Staudegger rolled out of the town where he was stationed and drove to the front lines. He arrived just as the leading Russian tanks were overrunning the German infantry. In short order, his gunner, Heinz Buchner, destroyed the three visible Russian tanks. 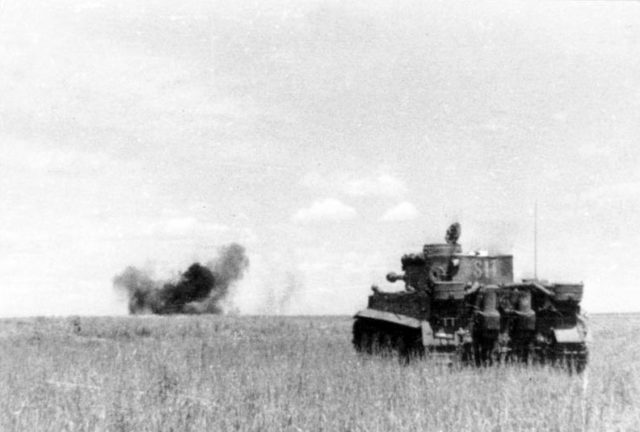 However, at that moment two more Russian tanks emerged from behind an embankment and started to fire. These were also destroyed. Staudegger’s driver Stahlmacher maneuvered the tank quickly to face the new threat. As more and more Russian tanks emerged from behind the embankment, they were destroyed one by one, until Staudegger and his crew had destroyed 17 altogether. At this point, Staudegger’s tank had run out of armour-piercing shells. However, he and his crew continued to engage the Russians with high-explosive ammunition. 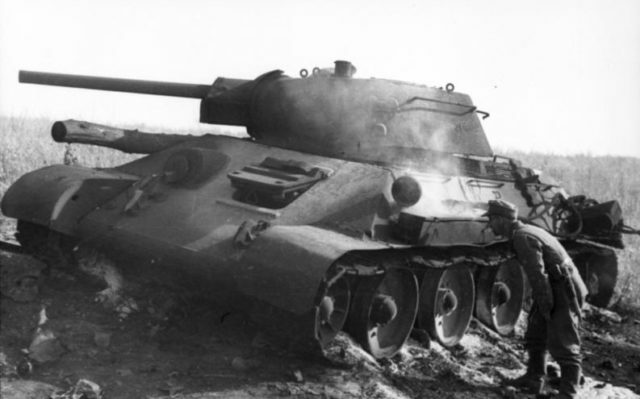 Despite their lack of penetrating power, these large caliber shells were still able to inflict catastrophic battle damage on the enemy, and this was evident by the destruction of a further five Russian tanks. 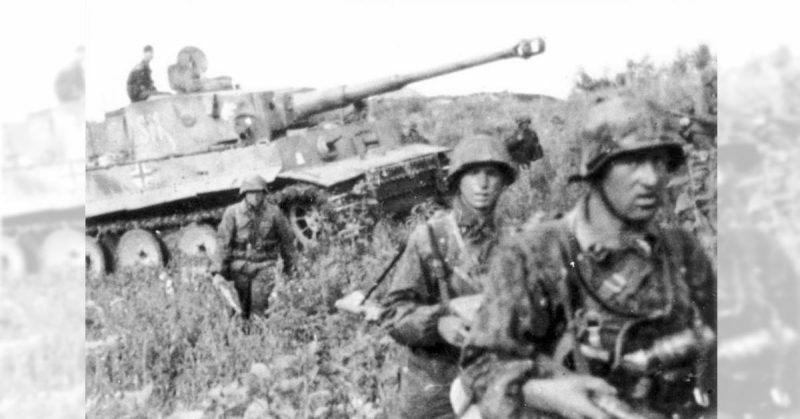 Finally, as they continued to take damage and risked losing their mobility, Staudegger’s Tiger fell back. But the Russian armored attack had been defeated. Over the course of the battle his tank was hit by Russian 76mm gunfire an astounding 67 times and yet was able to continue the fight and deliver its occupants to safety. Staudegger and his crew had not only destroyed 22 Russian tanks but had played an invaluable role in halting the Russian attack. For this action, he was awarded the Knight’s Cross of the Iron Cross, as the first ever Tiger crewman to receive this award. Unlike Wittmann, Staudegger would survive the war and pass away quietly in 1995. His actions on 8 July are just one example of the countless ferocious armor battles in the east, and a testament to the survivability and hitting power of one of the deadliest tanks of WWII.